History, with its flickering lamp, stumbles along the trail of the past, trying to reconstruct its scenes, to revive its echos, and kindle with pale flames the passions of former days. Under way at last, the ferryboat pulls away from the giant parking lot on Fidalgo Island and sets off for the San Juan Islands. For several hours, it will wend its way through a dozen islands, stopping about four times. Sometimes it then continues on across the international boundary in Haro Strait to Vancouver Island, landing just north of Victoria, British Columbia. I've caught the early morning ferry. In the wintertime, everyone aboard would be either a truck driver or a native of the islands: farmers, fishermen, carpenters, and the people who have retired to homes in the islands. They would cluster in the ferry's little coffee shop and take up conversations left over from last week's meeting in the grocery store. On a midday ferry in the summertime, the overwhelming impression is of excited tourists setting out on a minicruise, their blasi children milling around until captured by an indoor coin-eating video game. But the early morning ferry in autumn-winter-spring has a distinct homely quality to it, worth getting up early for. 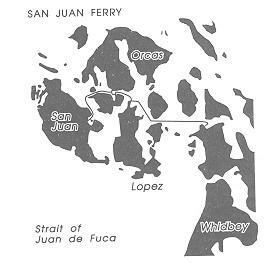 The east-west ferry route crosses much of the width of the glacier that came down from Canada into Puget Sound, scraping these islands clean (of course, they weren't islands then but hills in a broad valley, since sea level was more than a hundred meters lower during an ice age). Particularly in the winter when the islands are poorly defined in mist, you lean over the ferry's railing with a cup of hot coffee. You watch for the belated sunrise, seeing the patchy fog roll back revealing the rosy-white mountains and the evergreen islands, hearing the salmon jump and the crow complain. And listening to your own thoughts. It is very easy to feel oneself detached, a passenger on a meandering ark, who has been granted a privileged glimpse of a corner of the universe. You just have to remember what Richard Feynman cautioned, about the problems inherent in a beginner trying to guess the rules of chess -- while watching the moves on only one small corner of the board. IF THERE IS PURPOSE IN THE UNIVERSE, it is remarkably elusive. If things were arranged for human habitation and happiness, it's being kept a secret from us, hard though we look. The physicists and astronomers have certainly looked hard for a way out of a nasty bind. On the Universe's time scale of billions of years, the distant future seems to have two unpalatable choices: either the Universe will continue to expand until it becomes cold and motionless, or its expansion will reverse and eventually the universe will compress itself back into 10-42 centimeters. Neither Cold Death nor Heat Death seems compatible with human life -- or even the maintenance of information, any history that might aid a subsequent life form in a successor Universe. One can only look upon this situation as one of those evolutionary stimuli to "do or die," even more dramatic than the need to develop hunting skills to get through the winter: either figure a way around the obvious laws of nature, or you'll be erased and the Universe restarted (and even the re-expansion is uncertain) with a clean slate. The Big Crunch Imperative. For which the Greenhouse Imperative is (quite literally) the warmup. Given how we've gotten into the greenhouse mess, it might help if we understood ourselves a little better. How we work. Why we overdo things when it comes to reproduction. Where we came from. We might even discover some "purpose" along the way. TRYING TO GUESS THE RULES of ape-to-human evolution is, it would appear, a problem that extends far beyond the boundaries of stones-and-bones anthropology. There are a lot of half-glimpsed bases along the way that a theory has to touch, poorly defined though they may be. While surely only "a corner of the chess board," it's all we've got. One strategy is to identify common variations on a heritable theme that can be exploited, and by what. We have to trace that back to what happens during pre- and postnatal development, and how the gene repertoires alter. We have to spread this successful variant ape around the world, meaning that we have to identify exploitable resources, counterpressures, bottlenecks, new niches, and all the rest. And, since more than one "model year" is likely to be involved, repeat all this dozens of times, taking into account the niche expansions and the modifications to the environment that have occurred in the meantime, the growth curves of each item of natural selection or reproductive quirk, and so on. In analogy to how Puget Sound enhances the Pacific tides, we have to ask whether or not there was some "resonance" in evolutionary processes that the ice age rhythms exaggerated, by "pushing" at about the right repetition rate (not that we've found any resonance candidates yet). THE JUVENILIZATION for purely reproductive advantage in temperate zone boom times will rapidly be shaped up for its adaptive value. It is, after all, the winter-adapted populations that get the extra babies in the boom times associated with meltbacks. And winter happens once a year, producing a rapid selection for the juvenilized body styles that can, incidentally, feed themselves in winter. Boom-time juvenilization is all well and good, but by itself seems insufficient. The three-phase juvenilization-reenlargement-slowing cycle is much better. It demonstrates how, with a little unwanted help from the birth canal bottleneck, the fluctuating climate could have pumped up brain size by repeated juvenilizations. This could explain the relatively big head and a number of other juvenile features of modern adults (that flat face, those small teeth, etc.). So far, so good -- especially for the features preserved in fossils that can be studied by the paleoanthropologists. But by comparing humans to apes, we see a number of other features that were surely changed during that seven million years -- and some of them are features that no juvenilization cycle is likely to produce. Repetitions of juvenilization-reenlargement-slowing could produce a big brain but, had nothing else happened, it might have had the internal organization of an ape brain. Humans have more cerebral cortex, relative to deep brain structures, than does a juvenile ape. Humans have considerably more serial-sequential propensities than do the other primates: that too isn't a juvenile ape feature, simply enlarged. Juvenilization explains a lot, but not everything. And so we construct "Juvenilization Plus" theories. FIRST STOP IS LOPEZ ISLAND, and the currents are a little tricky here. The ferry approaches the landing from an odd angle, balancing out the tide and the winds, and glides right into the portal. A dozen passengers walk off the boat carrying luggage and parcels, several bicyclists follow, and then two dozen cars bump their way up the ramp (it's high tide). A few people walk aboard, followed by several cars, which are going from Lopez to one of the other islands. These cars back onto the ferry, because there is no room to turn around on deck. The last car aboard will become the first car off (what the computer programmers like to call a "last-in-first-out" buffer, similar to a pile of plates in a kitchen cabinet). Their drivers perform this task with nonchalance, as if accustomed to backing up a long driveway. Living in the islands develops some skills more than others. The whistle blows. The lines are cast off. We back out into the channel, sliding past several sailboats. Waves are exchanged, the people on the sailboats otherwise warming their hands on coffee cups as they too start the day. AT LEAST ON THE SURFACE, the hominid brain started reorganizing itself away from the ape standard more than two million years ago. That's the conclusion of Dean Falk; she studies the imprint that the brain leaves on the inside of skulls. The blood vessels and the cortical infoldings can often be seen, and each species has its own characteristic pattern. The australopithecines have an apelike pattern of folds -- then, at two million years, one starts to see a more humanlike pattern develop in the frontal lobe. By itself, this doesn't imply that function was changing -- the simultaneous enlargement of the brain starting just before two million years ago might have forced the cerebral cortex to fold somewhat differently during fetal development, and this might be without functional consequence. Indeed, some hyper-hardnosed skeptics point out, the uses of those frontal lobe areas for speech and plan-ahead might have waited until 5,000 years ago, just in time for the invention of writing to preserve them -- but I'd bet it all started closer to two million years ago. To assume that form evolved entirely before function strikes me as a "Sistine Chapel solution" -- Michelangelo's God finally providing the spark of speech to a fully shaped Adam. And besides, function tends to evolve before form follows, using makeshift arrangements until efficiency shapes up a better form than the original. THE NEXT STOP, only a short time later, is Shaw Island, with a ferry dock much smaller than the others and part-time employees not wearing the ferry system's uniform. Indeed, a nun comes out to lower the drawbridge onto the ferry deck, turning the winch by hand. She is incongruous, a medieval figure operating hand-powered technology that matches the tides to a rumbling ark, shaking its way into the portal. But this isn't the River Styx, she's not Charon, and Shaw Island is far closer to heaven than Hades. The Hallelujah Chorus keeps running through my head. It's such a good example of how the experts can temporarily borrow some nonexperts, as when the audience joins in. And temporal precision for throwing occasionally needs all the helpers it can get, a massive chorus whose timing becomes far more precise than that of even the experts. Unlike other examples of temporal precision such as sound localization, throwing is one-shot: you cannot average over a hundred repeats of a waveform to get your timing (the target tends to run away after your first attempt). You have to use a hundred timers in parallel instead. If, of course, you can muster them for the occasion -- if you have some borrowable brain. Was there some specific natural selection (beyond that for juvenilization more generally) for more cerebral cortex, for more serial-sequential brain circuitry? Especially the kind that can be converted into a Darwin Machine? Throwing accuracy is certainly demanding enough on the brain and has the long growth curve of niche-expanding proportions. While bigger is better, the real test is whether a brain can be functionally reorganized during "get set," so as to borrow all of those Hallelujah Chorus helpers. Juvenilization per se might have provided some advantages in that direction, given all those synapses saved from pruning, but perhaps there were variants in brain wiring that were better at this recruitment task, and so throwing success helped them survive and raise offspring even after the fickle climate reverted and boom times no longer encouraged precocious variants. A somewhat similar, though less detailed, "Juvenilization Plus" argument can be made for language, its usefulness selecting those variants in brain wiring that facilitated organizing our ideas, communicating them to others. It's not clear what demands this makes on the brain, or what its niche-expanding properties are, or if there is a decent growth curve involving many redoublings. But there were certainly some aspects of speech that appear to have been under considerable selection at sometime in the past. Compared to other primates, as I noted earlier, our larynx is located low in the neck. It starts out in the higher position but, during the baby's second year, descends several vertebral segments in the neck, elongating the vocal tract. This has some implications for the efficiency of speech: a longer vocal tract enables the larynx's rather crude sounds to be shaped up into the fancy phonemes we use. Vowels, in particular, become better differentiated as the vocal tract lengthens. This lengthening brings with it, however, a big disadvantage: our tendency to choke on food or fluids that "go down the wrong way," winding up in the lungs rather than the stomach. All other mammals (and human infants less than a year old) have an anatomical arrangement in the throat that generally avoids this -- but apparently the advantages of a lowered larynx have outweighed such common disadvantages as choking on food and aspiration pneumonia. And if the throat was under such natural selection for improving speech, you have to figure that the brain too was under some pressures in the same direction. Again, juvenilization won't provide for the vocal tract lengthening: it's not a feature of juvenile apes that can be retained by precocious puberty. THE THREE-PHASE BOOTSTRAPPING CYCLE (and whatever ancillary natural selection there was for brain reorganization) may "explain" our hunting prowess, our changes in body style, our big brains, and how we humans might have spread around the world so successfully. It doesn't speak directly to the rest of our uniquely human collection of serial-sequential abilities. What about music and dancing? What about our elaborate language abilities? What about intelligence of the plan-ahead variety, particularly our ethics? The speech-shaping argument can be extrapolated to more-and-better circuitry for grammatical language. Another possibility (not mutually exclusive) is that some other serial-order task, such as versatile hammering, produced the Darwin Machine capabilities. However, as I elaborated in The Cerebral Symphony, I think that these particular examples of uniquely human abilities were major beneficiaries, not major movers in their own right -- that each of those abilities represents a spare-time use of the same neural machinery that we occasionally use for accurate throwing. Call it a conversion of function if you like. Or an emergent property. Or just a gift (each was something largely unearned, at least initially). However important throwing and bootstrapping cycles may be in their origins, these secondary uses have to be examined in their own right. Secondary doesn't mean "less significant" -- sometimes the byproducts are more important than the products, as Havelock Ellis used to say. In serial-order behaviors, you have to string together one thing after another: hand-arm muscle command sequences, but also oral-facial-laryngeal command sequences, or what-shall-I-do-next plans, or musical notes, or the body-leg-foot movement cycles of dance. Furthermore, you have to string them together into unique sequences, not specified by the genes in the preprogrammed manner of walking, chewing, swimming, and breathing movement sequences. These aren't simple chain-of-beads strings either (though such are handy for illustrating the generations of a Darwin Machine) but rather linked events on many "channels," more like the roll for a player piano. But using this elaborate sequencing machinery for secondary uses need not always exploit its channel capacity; just chaining simple schemas seems powerful, though prepositions and embedded clauses might exercise more of that sequencer machinery (much as diagramming a sentence tends to fill in the blackboard below the one-line sentence). If we develop rules about chaining, we can greatly expand the power of words: syntax helps us identify actors and the acted-upon, spot an embedded clause, deduce whether a string of words is a statement or a query, about those present or in another time or place. With chaining rules so good that one thing reliably entails another, we can sometimes make novel chains with great explanatory power  like the ones we call "mathematics" or "logic," which so impressed the ancient Greek philosophers and served as a focus for learned culture long afterwards. It's easy to see why they were so impressed, but remember too what their enthusiasm served to blind them to: variations, and the competition between them. And the fuzzy logic associated with approximations. Less reliable, but more creative. FROM SEQUENCING TO LANGUAGE is not all just spare-time use: that's one of the implications of the descent of the larynx. What was so useful about speech or language that was powerful enough to overcome the considerable disadvantage of choking so often? Remember that natural selection isn't always about predators, pathogens, and food-finding. It is also about reproduction, and mate selection often has some peculiarities that are reflected in our anatomy and physiology. Nicholas Humphrey and Richard Dawkins, in a BBC radio program, discussed the possible role of sexual selection in evolving language. And I recently tried out my version of the idea on a group concerned with the evolution of language and intelligence. While this will likely remain an alien idea in anthropology and linguistics for some time (it does conflict with the Puritan Ethic, though not with Darwinism), you can see how female standards for male abilities could have bootstrapped the prehuman language abilities. Just as female birds seem to have favored elaborate songs by males (not to mention long and shiny feathers) when choosing a mate, so prehuman females might have promoted a fancier form of language, shaping up preadaptations such as throwing sequencers into something more specific for grammar. All a female need do is to favor males with language performance at least as good as her own. Women have higher verbal IQs -- but why? The answer probably lies in developmental modifications by testosterone, augmented by the possession of a Y chromosome (which only males have). Should a woman suffer brain damage, she is far less likely to develop aphasia, suggesting a better-organized language cortex. Testosterone does some odd things to brain lateralizations during childhood; even with equal genes for language, adult males may be substandard to females because of such developmental degradation. Furthermore, males are more likely to suffer brain damage during a difficult delivery; this too makes their brain organization more variable. Suppose that 10 percent of the males were substandard to nearly all females. So females selecting for the top 90 percent of the genome in language ability will serve to bootstrap language to even fancier levels in the next generation for both males and females. Males might degrade that inheritance a little during development, but they'd be better as adults than the previous generations -- and their daughters certainly ought to be better, lacking the testosterone degradation. That's a possible mechanism (and surely there are others as well), but how fast might the various mechanisms be? Female choice in mates has been greatly augmented by concealed ovulation sometime during hominid evolution, thus providing more opportunities for sexual selection than seen in the other apes. The chimpanzees provide examples of how this might work: some males are particularly adept at detecting the onset of estrus in a female, and also adept at persuading the female to "go off into the bushes" with them ("to consort" is the official term in primatology) for several days. Such males are likely to achieve many more successful pregnancies than the unsuspecting or antisocial males left behind in the main group. The suppression of estrus behaviors might serve to evolve sociable males that consort frequently (no longer knowing when ovulation occurs, males have to keep trying all the time, which means remaining socially acceptable as a companion). Communications skills are important in chimpanzees for promoting a consortship; surely they are also important in prolonging it, persuading the female not to return to the main group for awhile longer, preferably not until pregnant. Environmental selection is important, but it isn't the only way. And sexual selection, if we judge from the birds, often goes to extremes (magpie tail length, peacock tail iridescence) before the disadvantages counterbalance; prehuman sexual selection might be a quicker way to evolve language from a throwing-like preadaptation than would language's usefulness for finding food, avoiding predators, etc. Of course, once we had it, grammatical language would be useful in those ways as well. JUST ACROSS THE CHANNEL from Shaw Island is the ferry dock for Orcas Island. And there is a lot of traffic for Orcas, a large and mountainous island with several fjordlike channels that divide the island up into north-south lobes at the foot of Mount Constitution. Another leftover from the ice ages? Certainly the peak itself was well-covered by the Puget Lobe: the ice was probably twice as high as Mount Constitution. To be able to imagine this whole area covered by ice is surely a uniquely human ability among the animals of the world. Most animals have associative memories, but few seem likely to connect them in a string, like frames of a movie film. A dog could probably learn each different car in that line of vehicles waiting to board the ferry, but would it remember the order in which they drove up the ramp? OUR CONSCIOUSNESS OF THE PAST often has an aspect of connectedness: we remember episodes, novel events connected by a stream of time. Replaying this "tape" of the past is notoriously unreliable (as when we confuse one visit to the grocery store with another) but other animals may have even less episodic memory: they learn new objects, new people, new places (just as we also learn new words), but their abilities to recall complete episodes could be limited. Episodic memory is something which we may have acquired with our other exaggerated serial-order abilities, such as language and throwing. So animal consciousness might lack much of our narrative richness, and they might correspondingly lack our scenario-spinning (it needs episodic memories against which to judge candidates for novel scenarios). There are certainly aspects of human consciousness that seem particularly serial: spinning scenarios that attempt to explain the past, forecast the future. We tend to see ourselves as poised at a choice between alternative futures, thanks to this ability to project the past and present into a foreseen future. But consciousness is also noticing things, focussing one's attention on the present. When I use my right hemisphere to survey this scenery, I am mostly scanning, ignoring the details in favor of grand spatial relationships. Forests here, shining sea there, the ferry beneath me, the warm wind whistling past: I am simultaneously conscious of them all. At other times, I focus on particular objects and try to identify them, as when I concentrate on that sea gull, trying to use the color of the feet as a means of distinguishing between two common forms of gull hereabouts. This object identification, or word-finding, activity is a left hemisphere aspect of focussed awareness. Making decisions is often conscious, at least when dealing with novel courses of action that first require a little Darwin Machine massaging (Chapter 2), to eliminate the nonsense that randomness throws up and thereby evolve a plan of quality, safe to carry out. But we also decide in the sensory sphere, as when we entertain the notion that there are several species of gull and split the old "sea gull" category into two or three schemas. Darwin Machines can also lump schemas together, see if the components make sense (apples and oranges lumped into fruit); here the order of the schemas in the sequencer track is presumably ignored, with the sequencer merely acting as a versatile associative memory, capable of categorizing and contrasting collections of schemas. Darwin Machines may not be absolutely necessary for most of the aspects of consciousness, but they seem likely to greatly augment such conscious activities of their proud possessor. And they seem capable of solving the "seat of the soul" problem that fascinated Descartes: just where is this "chief executive" located within our brains? The inability of the neurologist to find a region of brain that is essential for consciousness has not caused the problem to disappear: each of us has the strong impression that we focus, decide, and move according to the central direction which we apply to our personal world. Yes, there are involuntary movements. Yes, there are subliminal perceptions. But they don't make the "illusion of centrality" go away. If there isn't a single anatomical site for this narrator of consciousness, how might various areas conspire to act "as if unitary"? As the Darwin Machine's population of sequences evolves, one string of schemas tends to dominate, becomes the most common sequence. It may be a string of schemas whose order is unimportant: that evergreen forest, that shining sea, and the ferry boat deck. Or the order may be relevant, as when I shape up a grammatical sentence in my mind, preparing to remark on the feet of the gull poised alongside the ferry, hovering in the breeze. If it is a command sequence for throwing, orchestrating those 88 muscles needed for projectile predation, ordering is absolutely essential. The success of a particular sequence in cloning itself implies that it may occupy substantial areas of cerebral cortex at the same time. It won't be like a series of little bird shapes, repeated over and over as on a wallpaper pattern or Escher design. It will probably be a spatial pattern of neuron activity rather like those nonsensical-appearing bar codes on product packages. There is a different one on each different product in the grocery store, adequate to evoke the product name and price, print them out on the cash-register receipt. Or the cortical representation could be a temporal pattern (what you get when scanning a bar code), repeating in many places like a chorus. Just imagine a string of nonidentical products, lined up on the checkout counter, producing a string of word-like representations, constituting a candidate sentence or novel category. Or a string of identical products, analogous to one word that speaks loudly to you. Cloned many times, that string of word representations may occupy a lot of my brain, once I've focused on the gull identification problem long enough to decide what to say. Just imagine the bar codes for five products, strung together -- but cloned hundreds of times, repeating like a wallpaper pattern throughout regions of association cortex. It is this cortical consensus which may constitute "conscious awareness," what I'll describe if anyone should ask me what I'm thinking about. There is no known stuff in the brain that corresponds to attentional resource.... Rather, there are different ways of using the finite neural network. When wide areas of the network are involved in one mental operation... other operations are deprived of the necessary cerebral functional space.... In other words, multi-purpose cerebral computing space can be used either for a wide-ranging but shallow encoding, or for a single but difficult mental operation. Similarly a plan of action, when finally shaped up by Darwinian processes into a thing of quality, all ready to let loose on my muscles, should also have many widespread clones. In both sensory and movement aspects of consciousness, both right and left hemisphere modes of noticing the present, both recalling names and recalling serial-ordered episodes of the past, Darwin Machine reasoning leads us to suspect that no one cortical area is crucial. Certainly no one antibody molecule is crucial for the immune response, nor is any one biological individual crucial for a new species: the new group is distinguished by the preponderance of a new type of individual, not any particular one. The "center of it all" turns out to be a widespread cortical committee of near-clones, in this view. Is consciousness the dominant harmony of the association areas, arising from near unanimity in a population of Darwin Machines, able to "speak loudly enough" to govern? Let me forestall an obvious bit of phrase-making: "The harmony of the hemispheres" isn't quite right, because the clone need not take over an entire hemisphere, much less both of them. Just how large a consensus is needed to dominate probably depends on competing Darwin Machines (one imagines the sequencers as partitioned into various island-like subpopulations, each evolving quasi-independently) and how strong a consensus they have been able to reach about other things (which we otherwise know only as the subconscious). The access of a particular sequencer population to language processes is probably also important; left prefrontal association areas might have better access than right parietal association areas, for example. Surely, however, a takeover of conscious awareness need not imply a cloning of all association cortex. The cortical consensus is particularly attractive as an explanation for consciousness because it allows for specialized cortical areas (in the Hallelujah Chorus analogy, the expert choir) without having them exclusively committed to one task (borrowable as a helper by another expert). It allows for a center of consciousness without a physical hub, vulnerable to pinpoint damage by a broken blood vessel. It allows for focussing on the present in both left- and right-hemisphere styles. It allows for novel courses of action, for decisions, for both thought without action and reaction without thought. And it has a natural home for subconscious processes, a route whereby they can sometimes come to dominate. Not a bad start, that -- considering that we've probably explored only a fraction of the "chess board" of mental activities. THE FERRY IS MOSTLY EMPTY now, our load lightened. But more than a dozen cars drive up the ramp onto the ferry, bound from Orcas to Friday Harbor. They didn't have to back up because there is now room for a car to drive to the rear of the ferry and turn a half-circle, join the rear of a line of Friday-Harbor-bound cars, pointing the right way. A little working room helps to avoid awkward maneuvers, allow for first-in-first-out queues to form naturally. Serial-sequential behaviors are important in the list of uniquely human happenings, but we wouldn't be human without quite a few others, such as the concealed ovulation that contributes to our mating system, our unusual attraction to swimming and shorelines, and similar modifications from the standard ape that must be separately accounted for. Throwing (or whatever it was that selected for the augmented serial-order machinery, conceivably language's usefulness) may have bought us a lot, but not everything. Is the picture of hominid evolution sketched in the preceding chapters correct? Almost surely not, at least in some details -- and probably in some major feature. First of all, I worry that we could presently have insufficient parts with which to construct a sufficient theory; I didn't have all that much choice. ** The throwing theory is about the only detailed explanation that has been attempted so far, regarding how a uniquely human skill might have rapidly changed the brain; other factors which might be equally important, such as language and toolmaking skills, are harder to relate to brain size and reorganization requirements at our present state of knowledge. ** Juvenilization-neoteny-paedomorphosis seems to be the only broad-scale summary of relevant developmental changes that we have to work with -- and certainly the only one easily related to climate fluctuations. ** And the r-K spectrum is about the only good summary of ecological opportunism and how it interacts with such developmental changes. While I can relate them to hominid brain changes via that three-phase pump, I'd feel more confident if I'd had more choice of available subprocesses. Secondly, reading the history of science tends to promote caution, if not humility. One sees all the perfectly reasonable proposals that turned out to be wrong. But one also sees how they set up targets, both to challenge and to mimic-with-variations. I suppose that what I am really trying to do is to improve the standards of what constitutes a serious proposal for hominid evolutionary mechanisms. And doing this by illustrating the many viewpoints that must be brought to bear: the ethology of niche-busting behaviors, their neurophysiological mechanisms and the developmental modifications that affect them, the ecology of the new model and how it is influenced by climatic changes, and so forth. It isn't just brain size: these evolutionary resources have also got to explain brain reorganization as well. Not to mention such emergents as our peculiar consciousness. Man is the only being that knows death; all others become old, but with a consciousness wholly limited to the moment, which must seem to them eternal. They see death, not knowing anything about it.